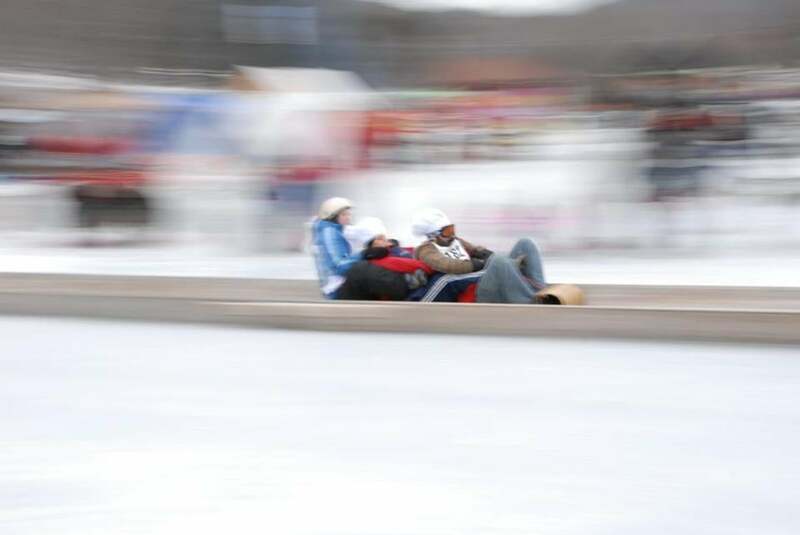 Riders try Camden’s Jack Williams Toboggan Chute. CAMDEN, Maine — Five years ago, when Netherlands natives Raymond Brunyanszki and Oscar Verest bought the Camden Harbour Inn, they had one big worry: winters in Maine. “We thought it was going to be brutal — dark and dead,” says Brunyanszki. There was no need for concern. Maine in winter, we admit, is not always an easy sell. For our Camden weekend getaway, we promised our husbands that we’d be home in time to watch the Patriots (our goal, too), and enticed them with photos and information about dining in Camden. Food is always at the top of our list, and Camden didn’t disappoint; it’s a culinary hot spot, even in winter. Cappy’s Chowder House is a longtime favorite, known for its award-winning clam chowder; locals rave about breakfast at Mariner’s (try the blueberry pancakes), and the top-notch, inventive cuisine at Francine Bistro, where winter specials might include chicken liver bruschetta and local chicken deep fried in duck fat. At the Fresh restaurant, chef Steve Steeves puts out a menu of comfort dishes, like lobster stew, warm kale and squash salad, chicken pot pie, and slow braised pork short ribs. Several people steered us to Long Grain, where we lunched on hot, deeply-flavored bowls of pad Thai and Chiang Mai curry noodles. Later that evening, we enjoyed an elegant meal at Natalie’s, where two-time Food & Wine magazine Best New Chef of the Year nominee, Geoffroy Deconinck, worked magic. Beef agnolotti, lobster saffron risotto, and the pig’s trotter served with a soft quail egg and truffle shavings were standout dishes. The following evening, we enjoyed a five-course meal at the Hartstone Inn. Chef-owner Michael Salmon, who once cooked for Julia Child, focused on locally sourced, more traditional fare, like butter-poached lobster, seared cod fillet, and slow-cooked beef ribs. We see nothing wrong with a strictly eat-and-sleep getaway (and our spouses were more than content to keep it that way), but seaside Camden has plenty of outdoor recreation, too, even in the dead of winter. If you have kids in tow, you’ll want to visit Snow Bowl, a sweet little ski area, just minutes from downtown. There are eight marked trails — most are perfect for easy-does-it skiing and snowboarding — that spill down the sides of Ragged Mountain, and a small area for glade skiing and boarding. So what if it’s been a while since you grabbed a tow bar? You’ll want to take the Big T-Bar to the 4,100-foot summit, where you’ll have views of Camden Harbor and the Atlantic Ocean. There’s also a small lodge, ski shop, rental shop, and tubing area. If you go to Camden, Maine. 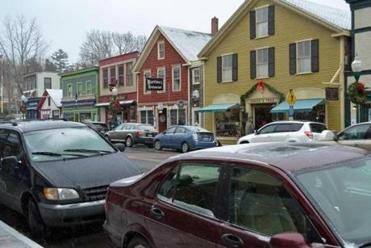 . .
Where to stay and things to do in Camden, Maine. Snow Bowl is also home to the old-fashioned Jack Williams Toboggan Chute, one of the last of its kind in the country. The 400-foot wooden chute, first built in 1936, has been restored twice. Long before you clamor to the top of the chute launching platform, you’ll hear screams and laughs, and the rumble and roar of the toboggans. Hold on; this is no ordinary sled ride. The toboggans drop 70 feet, zooming through the woods at speeds reaching 30 miles an hour before sliding across frozen Hosmer Pond. (During the US National Toboggan Championships, held here annually, speeds on the chute can reach up to 45 miles an hour.) The chute is open on weekends after the pond is solidly frozen. For a tamer experience, bring your ice skates for a twirl on the 55-acre pond, near the boat launch site, and far from the speeding toboggans. Camden has a number of unique boutiques and shops, which stay open during the winter. At pretty, 5,500-acre Camden Hill State Park there are some 30 miles of well-maintained hiking and snowshoeing trails. The most popular and rewarding trails climb to the top of 780-foot Mount Battie. If you’re feeling energetic, take the steep, half-mile Mount Battie Trail (1 mile round trip) to the summit, or opt for the gentler, 1.4-mile hike (2.8 miles round trip) along the auto road. Either way, when you reach the top, you’ll have sweeping views of the town, Camden Harbor, and Penobscot Bay, and on clear days, Cadillac Mountain in Acadia National Park. We loved the charming 66-acre Merryspring Nature Center off Route 1, straddling the Camden-Rockport line. The nonprofit, privately-owned nature park and education center has a network of trails, open year-round. You can hike or snowshoe woodland trails, or cross-country ski the open meadows. Along the way, look for animal tracks; otter, turkey, raccoon, rabbit, porcupine, moose, and bobcat have roamed the park. If you’re into wildlife watching, go off-track to the wetland areas, where you may see deer and barred owls. Enough adventure, we said: It was time to visit the Cellardoor Winery and Vineyard, a 68-acre farm in Lincolnville, about 5 miles from Camden. The views of grape vines, fields, and surrounding mountains were pretty, but the real draw was inside the restored 200-year-old post-and-beam barn, where visitors can select up to six, very healthy-portioned wine tastings. “Well, it’s Maine wine; we can’t take it too seriously,” Chuck, Pam’s husband, commented, as he bellied up to the tasting bar. But even he, a wine connoisseur of sorts, was pleasantly surprised by the vineyard’s Clary Hill Blue, made of 100 percent wild Maine blueberries (“This would go good with a peanut butter sandwich,” he commented), and Treasure, another wild Maine blueberry wine, infused with Maine maple syrup. We spent our final few hours poking around Camden’s unique shops and boutiques, including the Ducktrap Bay Trading Company, showcasing more than 200 artists, including some amazing wildlife carvers, and Once a Tree with more than 250 lines of woodworking from around the world. On the way home, it was Chuck who suggested we return for another weekend, perhaps the first weekend in February to watch the National Toboggan Championships.